In the story, “Just Another Gilded Age,” globetrotting Justice International troubleshooter Rob Hanes is hired to investigate the mysterious death of a German engineer who was consulting on the construction of a high-speech bullet train in China. But in the course of his investigation, Rob uncovers corruption that reaches up into the highest levels of the ruling establishment. Inspired in part by real life scandals that have recently rocked the country and made international headlines, the story features the kind of intrigue, mystery and topicality that have made Rob Hanes Adventures a favorite among fans of classic high adventure. Set in the modern day, the long-running indie series continues the tradition of the classic adventure comic strips like Milton Caniff's Terry and the Pirates and Roy Crane's Buz Sawyer — with dashes of light-hearted humor reminiscent of Will Eisner's Spirit. Readers and fans alike have lauded Rob Hanes Adventures for updatingf the classic adventure strip genre for modern day audiences. Every issue of Rob Hanes Adventures is self-contained. All back issues are still available, including issues 1–14 and two trade paperback collections of earlier work, Rob Hanes Adventures, Vol. 0 and the Rob Hanes Archives. For more information about the series, previews and to purchase back issues, visit the WCG Comics website at wcgcomics.com. 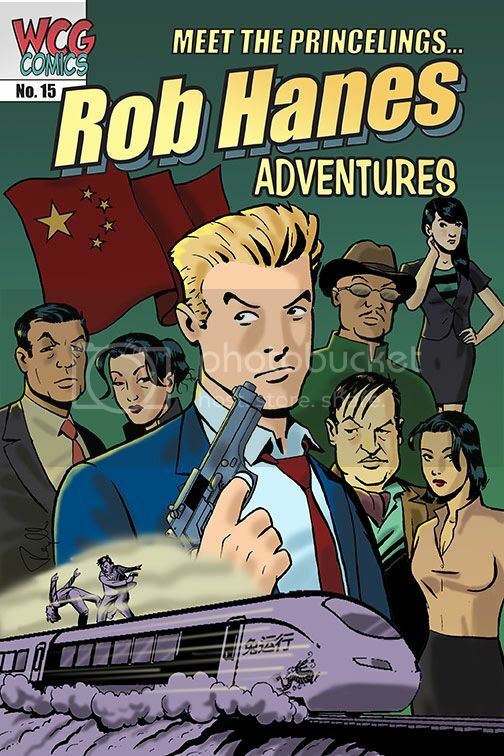 Over the years, Rob Hanes Adventures has been reviewed, spotlighted and featured in numerous respected comics industry news publications and websites, including the Comics Buyer’s Guide, Newsarama, Comic Book Resources, and Bleeding Cool. The series also was featured at wired.com and included in 1000 Comic Books You Must Read by Tony Isabella (Krause Publications, 2009). The year 2014 marks WCG’s 20th anniversary publishing. The company also makes its 11th consecutive appearance as an exhibitor at the 2014 San Diego Comic-Con and its 17th overall in July. More details about the 20th anniversary celebration and WCG’s Comic-Con appearance will be made available soon. For more information about WCG Comics, visit wcgcomics.com or facebook.com/rhadventures.